Small tree, 3 to 7 m high, stem smooth and shining, succulent, with abundant white latex; easily breaks. Leaves: crowded at the terminal end of the branch, commonly oblong in shape, reaching a length of 40 cm and a width of 7 cm. 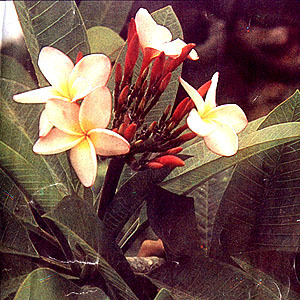 Flowers: fragrant, the upper portion whitish, while the inner lower portion yellow, 5 – 6 cm long. Fruits: linear-oblong or ellipsoid follicles. Usually cultivated for ornamental purposes. There are several species of cultivated Plumiera, very similar to P. rubra but for the color of the corolla. Collect from May to October. Bark contains a bitter glucoside, plumierid (2%). Latex contains resins, caoutchouc and calcium salts of plumieric acid: cerotinic acid and lupeol. Leaves contain a volatile oil. Sweet tasting and neither warming nor cooling in effect, aromatic. Antipyretic, diuretic, emmenagogue, febrifuge, purgative, rubefacient. Decoction of bark is used as purgative, emmenagogue, and febrifuge. Preventive for heat stroke: the material may be taken as a cooling tea. For dysentery, diarrhea during summer season: use 12 to 24 gms of dried material in decoction. Arthritis, rheumatism, pruritic skin lesions: Mix the latex (sap) with coconut oil, warm, and apply to affected area. Decoction of the bark is used as a counterirritant on the gums for toothache. The latex mixed with coconut oil is used for itching. The juice is rubefacient in rheumatic pains, and with camphor, is also used for itching. A poultice of heated leaves is beneficial for swellings. Decoction of leaves for cracks and eruptions of the soles of the feet. Infusion or extract from leaves is used for asthma. This entry was posted in List of Medicinal Plants in the Philippines and tagged Kalatsutsi on March 16, 2009 by Pinoy Herbs. what’s the proper way of growing kalatsutsi? can i do pruning also on kalatsutsi? Where can I buy this plant? What is the proper way to grow this plant? Can this plant grow back after winter? I really want to plant this flower and I live in Minnesota. Thank you!